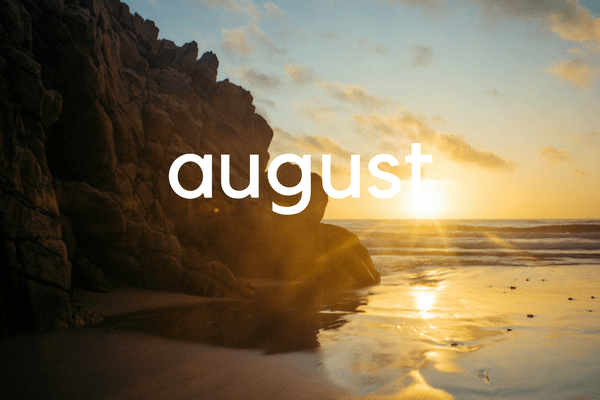 What does summer feel like in Morocco? 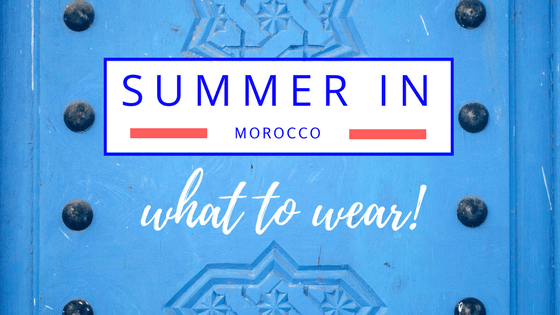 Use this guide to make sure you are cute, comfortable and ready for anything in Morocco’s heat. 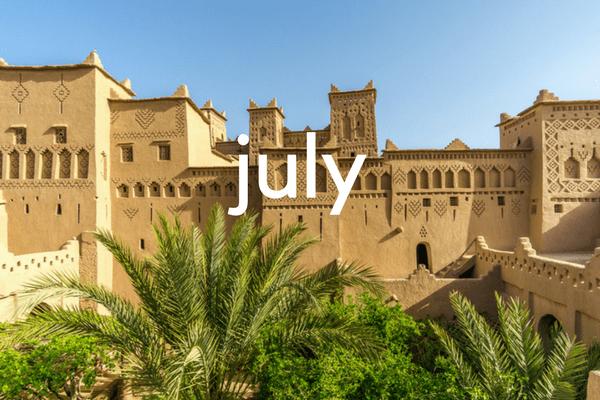 The weather in Morocco is arid (think California), so daytime summer temperatures easily reach 100F or higher, but become cooler once the sun dips down. Most homes and buildings are not air-conditioned, but are built to remain relatively cool. Plan your daily activities with this in mind – opt to take your big outings during the morning and evening hours while relaxing in your riad or at restaurants during the intense afternoon sun. 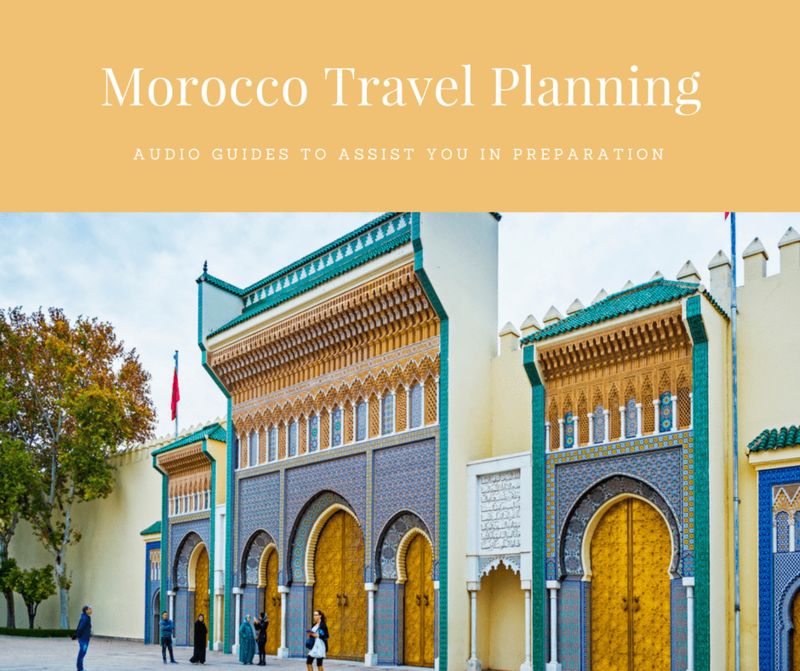 Also consider adding an escape to one of Morocco’s beautiful coastal towns or a dip in one of Marrakech’s pools to your itinerary for a refreshing break. 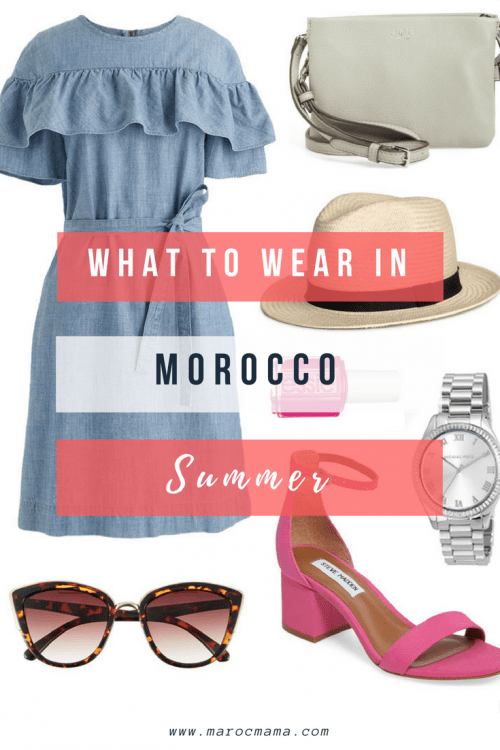 Now, what to wear to enjoy your summer Moroccan adventure? The number one question ladies ask is “how covered up do I need to be?” The answer to that question really depends on where you plan to be. 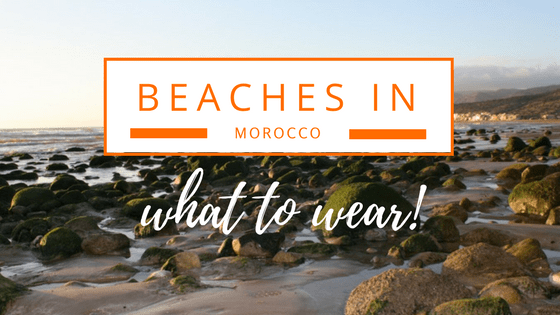 In large cities, it’s acceptable to wear pretty much anything but do keep in mind Morocco is a Muslim country and wearing very short skirts or shorts is frowned on. Likewise see through or partially see-through tank-tops with nothing underneath, tube tops, and belly bearing shirts are better left for the club than walking around the medina. If you’re planning to visit the beach or pool check out this guide on swimwear. These ideas will keep you cool, sun protected and stylish! 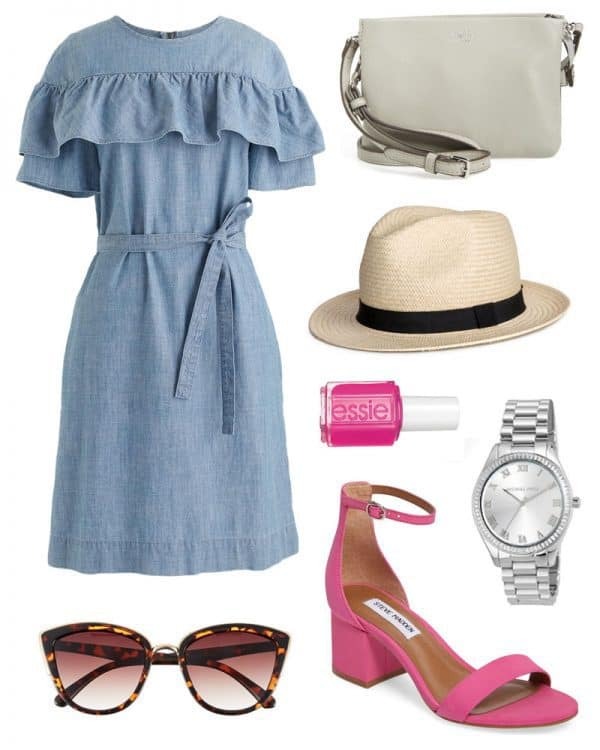 Chambray dress: In the hot temperatures of a Moroccan summer, chambray fabric is perfect for clothing pieces. This dress is both breathable and durable, while remaining cute and stylish. This dress is additionally practical with shoulder and arm coverage for protection from the intense afternoon sun. Cotton and linen are also great fabric options when choosing outfits for the heat. Ankle strap sandals: Airy shoes that let your feet breathe will be your friend in the summer heat. Pack a pair that can be used for dressy occasions but also include a practical pair (like those pictured in my What to Wear at the Beach guide) for days when you plan to do more walking. Sun hat: Sun hats are not only practical, but add extra flair to any outfit. Keep the sun out of your eyes, your face protected against sunburn and dress up your day-to-day look. Essie ‘Love Sheen’: Don’t forget to add a splash of color to your summer style in Morocco. Vibrant nail polish can go a long way in adding a fashion statement to any look. If you are like me, and love cute nails, but don’t always love applying the color yourself, add a pedicure to your “must-have Morocco travel experiences”. Seriously, spend a day doing nothing but spa treatments – it’s the ultimate pampering experience. Vince Camuto crossbody (on sale! ): Cross-body purses are a must in Morocco. Not only are they a practical size for hauling around all day, but you can easily keep them close to your body in busy city markets. Additional features I love about this purse are the zipper for extra security and the versatility of using it for daily adventures and a dressy night out in Morocco. Michael Kors Watch (major sale! ): Don’t miss the train or bus or more importantly your dinner reservations because you lost track of time! It’s easy to do in a new country, as the day to day flow can be so different than at home. A watch is one of the essential pieces to pack when traveling to any destination. Sunglasses: Have I stressed yet that it’s going to be sunny in Morocco in the summer!? Along with lightweight clothes and a sunhat, don’t forget a pair of sunglasses. Even in the shaded streets and covered stalls of the medina, you will find yourself in need of this trusty and critical accessory. 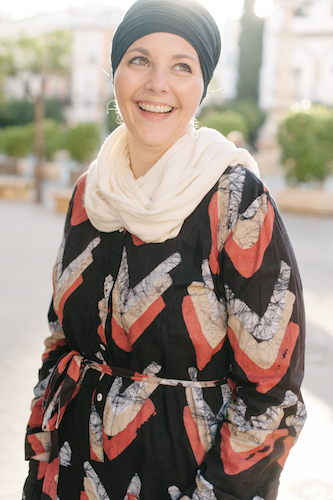 Tunics, maxi dresses, flowy cover-ups and linen pants are stylish and lightweight clothing pieces that are practical for enjoying a Moroccan summer. Add these looks to your wardrobe by clicking on your favorite images! 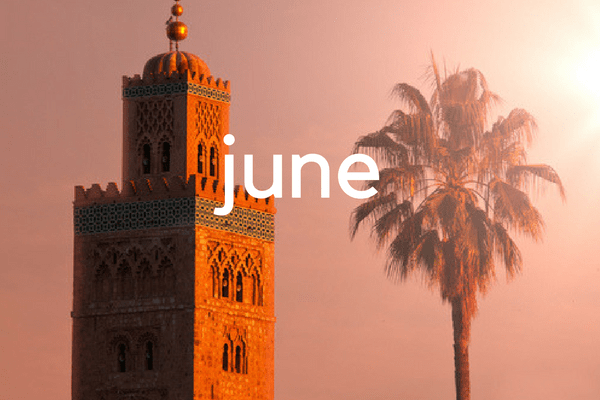 Now that you know how to stay cool in the summer sun, start planning your ultimate dream trip to Morocco! 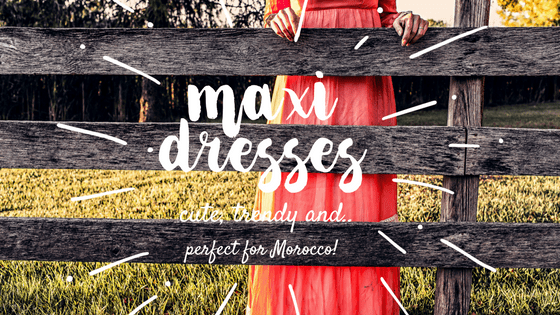 16 Cute, Modest Maxi Dresses for Morocco + More!